MEF18 Proof of Concept, 29 - 31 Oct - Multi-Domain, Application-Defined Interconnection Orchestration. PoC Participants: AT&T, Equinix, and Ciena. This group won the prestigious MEF18 PoC Gold Award. Speakers: Marco Naveda, Principal Architect, Office of the CTO, Ciena and Oleg Berzin, Senior Director, Technology Innovation, Equinix. Software Defined Interconnection Exchanges enable public/private peering using secure interconnection across a multi-domain global virtual fabric and federated orchestration using open LSO APIs. This can enable @scale deployment of massive IoT with edge clouds, network clouds, and public clouds per application slice. Secure IoT services are also possible with machine inference engines at the enterprise edge. A broad ecosystem of enterprises, edge cloud providers, network cloud providers, and public cloud providers can leverage and benefit from this global virtual fabric. In this PoC, the Ciena Blue Planet mulit-domain orchestrator is unifying the enterprise customer experience across the micro edge, the macro edge, and hyper-scale cloud. The PoC illustrates interworking between the Blue Planet orchestrator and the open source ONAP orchestrator supported by AT&T and others collaborating within The Linux Foundation. The PoC incorporates LSO Interlude and LSO Legato interfaces for service orchestration. MEF18 Proof of Concept, 29 - 31 Oct - MEF 3.0 Implementation for Orchestrated Multilayer Optical Transport. PoC Participants: CenturyLink, Telefonica, TELUS, Infinera/Coriant, and NEC/Netcracker. Speaker: Jack Pugaczewski, Distinguished Network Architect, CenturyLink and MEF Distinguished Fellow. This MEF 3.0 Implementation POC demonstration shows multiple MEF 3.0 LSO APIs and TAPI Connectivity, Topology, and Notification APIs working collaboratively to illustrate automated service orchestration, fulfillment, and assurance for MEF 3.0 Subscriber Layer 1 Connectivity Services in an Ethernet/OTN overlay/underlay multi-technology, multi-layer, multi-domain network. This is in support of bandwidth-on-demand and dynamic restoration use cases. The PoC demonstrates the power of applying generic network abstraction concepts such as constraint, forwarding, and termination to control, manage, and orchestrate multi-technology, multi-layer, multi-vendor domains in a consistent manner. This is done using a common API framework – including the MEF LSO Presto Network Resource Provisioning (NRP) API that is built on top of the ONF Transport API framework – to provision and control L2/L1/L0 transport network resources in support of corresponding MEF 3.0 services. The PoC also incorporates LSO Interlude, LSO Allegro, and LSO Adagio APIs. The PoC leverages and builds on the recently concluded joint MEF-OIF-ONF 2018 worldwide Transport API interop demo, thus bringing the optical transport implementation expertise into MEF, keeping with the MEF 3.0 objectives. Finally, the PoC fulfills the key object to demonstrate the viability of MEF 3.0 transformational global services framework for defining, delivering, and certifying assured services orchestrated across a global ecosystem of automated multi-technology, multi-layer networks. MEF18 Proof of Concept, 29 - 31 Oct - Instantiation and Delivery of SD-WAN over a Virtualized and Orchestrated Wholesale Carrier Ethernet Access Service. PoC Participants: BringCom, Isocel, SimbaNET, and Versa Networks. Speakers: Ishkhan Matirosyan, Senior Network Architect, BringCom and Rakesh Sharma, Solutions Architect, Versa Networks. BringCom, with its operating partners SimbaNET and ISOCEL Telecom and its technical partnership with Versa Networks, is deploying next generation networking services throughout the African continent. BringCom is expanding its software-defined networking and network function virtualization (SDN/NFV) platform over its Pan African connectivity network. This PoC demonstrates an SD-WAN service connecting 3 sites in Africa with instantiation of 3rd party VNFs over its virtualized infrastructure, including a universal CPE at one of the sites. The overall topology of BringCom's SDN/NFV platform includes ONAP, LSO Interlude and LSO Legato APIs, and an SD-WAN domain. BringCom's SD-WAN services are provisioned via IP/MPLS and Carrier Ethernet CE 2.0 certified underlying networks. These services are utilized while providing intelligent and elastic carrier grade regional access circuits. MEF18 Proof of Concept, 29 - 31 Oct - Blade Runner – Orchestrated Multi-Domain Augmented Reality. Formal PoC Participants: Vodafone, Verizon, Ericsson/CENX, EXFO, and Fortinet. Other companies also supported the PoC and are mentioned in this video. Speakers: Yogesh Pathare, Director, Product & Strategy, Ericsson and Ihab Mahna, Solutions Architect, EXFO. Modern networks are ushering in a new era of unlimited data and Internet of Things (IoT) use cases, such as smart cities, smart industries, connected cars, and remote surgery. Aligned with modern cloud-based and software-defined networks, the Blade Runner PoC showcases how AI-based augmented reality can be used to support the maintenance of remote industrial equipment and vehicles, all facilitated by using the latest in multi-access edge computing technology. The PoC's primary focus is to enable a diverse ecosystem of partners that includes multiple operators to seamlessly provide a composite set of cloud services. It makes use of industry standards, including open APIs and modelling languages (TOSCA), to allow shared service catalogues and faster deployment of cloud services, and to provide end-to-end, multi-operator closed loop assurance and wholesale enterprise billing/charging operations. The PoC uses the TM Forum Open Digital Architecture (ODA) at its core to demonstrate the need for abstract orchestration layers, properly integrated through MEF LSO Interlude APIs and TM Forum Open APIs. It demonstrates how a modelling language can enable a shared definition of complex 5G service chains that can be deployed by different operators. In addition, standard models provide a set of common policies/rules to serve the needs of closed loop assurance, even across different enablers. Complexity is an increasing problem in service provider networks, says Vikash Rungta, Product Marketing Manager, Infinera, especially as new applications such as IoT and virtual reality lead to rapid changes in traffic patterns. At MEF18, PCCW Global presented a proof-of-concept demonstration that involved Sonata API functionality to enable service quoting, ordering, mocked-up service delivery, and billing. This PoC proves that is possible to deliver orchestrated services across a chain of carriers, says Shahar Steiff, AVP, New Technology, PCCW Global. It also highlights the importance of having a unified information model and process amongst operators. MEF18 featured a lot of hot topics, especially network automation, SDN, NFV, and SD-WAN, says Roopa Honnachari, Industry Director, Business Communication Services & Cloud Services, Frost & Sullivan. MEF's work in standardizing SD-WAN service specification, as well as its MEF 3.0 framework for orchestrated services, is helping to drive the digital transformation of enterprise customers. At MEF18, Spectrum Enterprise, which is the division of Charter Communications focused on wholesale carrier and enterprise services, presented a proof-of-concept demo of a self-optimized, application-aware network. Gunnar Peters, Senior Director with Spectrum Enterprise, talks about dynamic service enablement. SES Networks, a global satellite provider, is already offering a MEF-certified Carrier Ethernet service of its MEO fleet. SES Networks is the only satellite provider currently offering this capability, says Eric Watko, Executive VP of Product Marketing and Strategy. The company is looking to make this service truly dynamic and seamless for terrestrial carriers worldwide. What is a service-driven network? It is a set of capabilities that sit between a core network and the business support layers above, says Yogen Patel, Head of Products and Solutions Marketing, Amdocs Open Networks. Ultimately, this means that the network can automatically adjust to user demands. At MEF18, Telco Systems presented its new 100GE T-Metro 8100 service demarcation and aggregation platform, as well as its NFVTime uCPE solution, which runs on either x86 or ARM-based processors. Ariel Efrati, CEO of Telco Systems, comments on these recent launches and says the company is performing very well, having just recorded a 28% year-over-year growth in its business. 2019 is expected to be very big on NFV as service providers reinvent their business models. At MEF18, Clear Blockchain Technologies presented a proof of concept for the intercarrier orchestration and clearing of bandwidth on-demand services. Gal Hochberg, the company's CEO, says a blockchain-enabled billing and settlement system is needed between carriers to keep up with networks as they become more agile and dynamic. Big data platforms can drive proactive service assurance for carrier networks says EXFO's Anssi Tauriainen, Director of Data Science and Advanced Use Cases. At MEF18, EXFO participated in a Proof-of-Concept (PoC) that examined various data sources, such as passive monitoring data, active test data and fiber monitoring data. A dynamic, network topology discovery component was used to correlate the data. Various applications for troubleshooting and customer care purposes were then employed. AI and machine learning enabled real-time anamoly detection, automated root cause analysis, and forecasting. 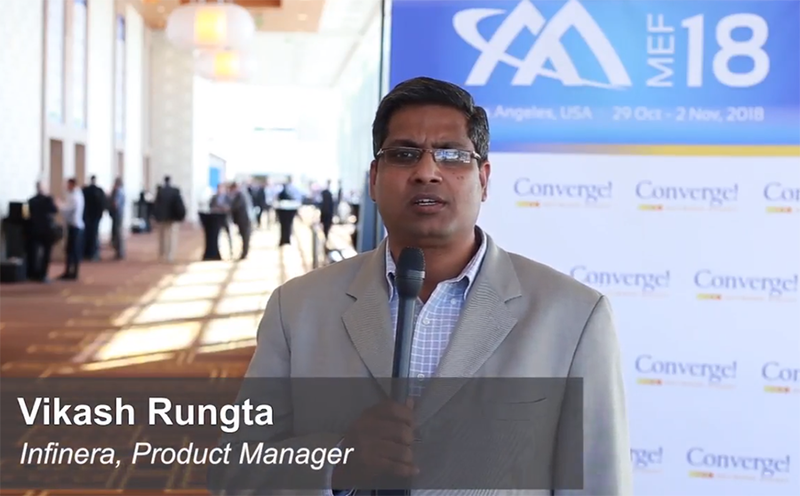 What does network transformation mean to CenturyLink? Andrew Dugan, SVP Technology Planning & Network Architecture, CenturyLink says it is vital to understand that customers are undergoing transformations of their own. Enterprise applications are getting distributed into multiple clouds. Some workloads stay in private data centers and others are moved into hybrid or public clouds. Carriers, like CenturyLink, must provide networking services that are equally as dynamic as the service offered by cloud providers. CenturyLink is developing products that allow for dynamic service creation. This allows for new connections to be set-up, capacity to be scaled, and VLANs to be controlled. Another area of interest is MEF's LSO (lifecycle service orchestration) APIs for enabling dynamic services across carriers to public clouds. CenturyLink is heavily supporting MEF's efforts in this area. Enterprise transformation is a big part of ongoing work at MEF, says Adam Saenger, Vice President of Networking Solutions at CenturyLink. Enterprises are increasingly using software-defined networking to power hybrid clouds. CenturyLink is working hard on the orchestration of these functions so that customers can move "at the speed of enterprises" and not at the speed of telecom. CenturyLink first introduced dynamic capacity in its network seven years ago. Over the past 12 months, it has added capabilities such as dynamic VLAN management spanning into cloud environments. Most recently, CenturyLink announced global availability of SD-WAN, and dynamic connections on demand to cloud resources. 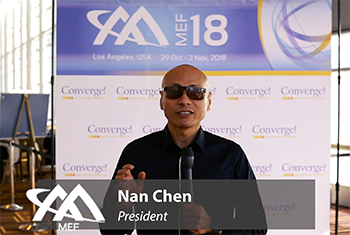 There are a few big takeaways from the MEF18 event in Los Angeles, says Daniele Mancuso, Executive VP ICT Engineering, Sparkle. First, it is clear that MEF is playing a transformational role in the industry not only in standardization but also leapfrogging innovations. Second, SD-WAN is the candidate technology to bring us to the future. A new generation of enterprise services will ride SD-WAN. Third, MEF is doing a great job with the development of Cantata and Sonata APIs. Fourth, network cloudification is hot trend, especially driven by containerized workloads. Fifth, artificial intelligence and machine learning will take us to the next step on intent-based networking. The future is bright. Keep on following us! One year ago, MEF 3.0 set out a bold framework for carrier network transformation. Over the past 12 months, the MEF community has really executed on this vision, says Pascal Menezes, Chief Technology Officer, MEF. This execution includes innovations at layer 1 optical transport, layer 2 Carrier Ethernet services, and automated, managed access E-Line services. Additional, MEF is working on IP service overlays. MEF has also just delivered draft specifications for SD-WAN services. This week, MEF released its Sonata LSO (Lifecycle Service Orchestration) API in both specification form and as a sofware development kit (SDK). Most people have no idea how big a deal this really is, says Dan Pitt, Senior Vice President, MEF. This means that the specification is not final. It won't be final under the SDK has generated feedback from developers. The notion that MEF can issue specifications that are not perfect, but open to improvements through iteration, is quite powerful. This is standards development at the speed of software. Think of it as the industry's first DevOps approach to standards development.